A little over a month ago I wrote a post detailing some cool stuff I found over several weeks in Hampstead. The bins sat full at the end of the driveway for nearly two months until last night when they finally made their way to the curb. A bunch of old carpet sat next to them, indicating that renovation of the house has begun. 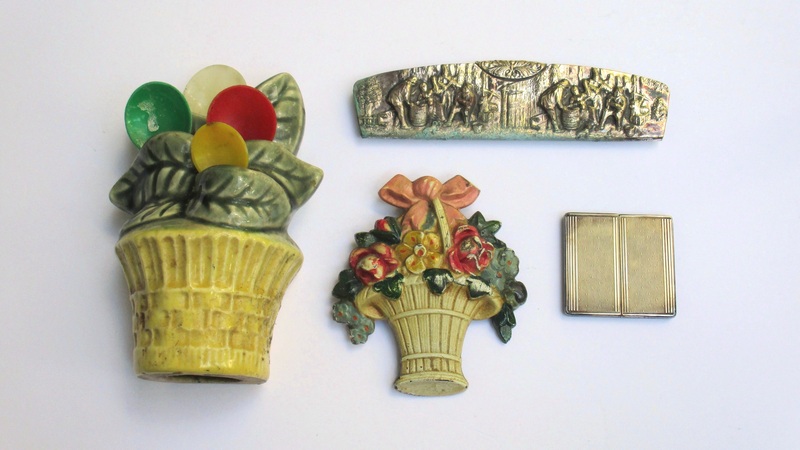 I saved a few small knick-knacky pieces. On the left is an old pottery piece made to hold teaspoons. I’d guess that it was made in the 1940s. 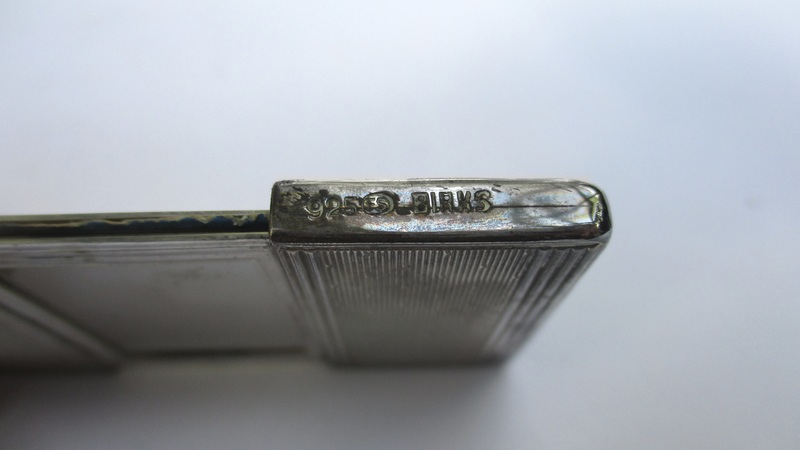 At top left is a dutch silver plated comb (marked ZILPLA90). There is some corrosion but it should clean up alright. This thing is a bit strange. It’s marked Birks and is made from sterling silver. 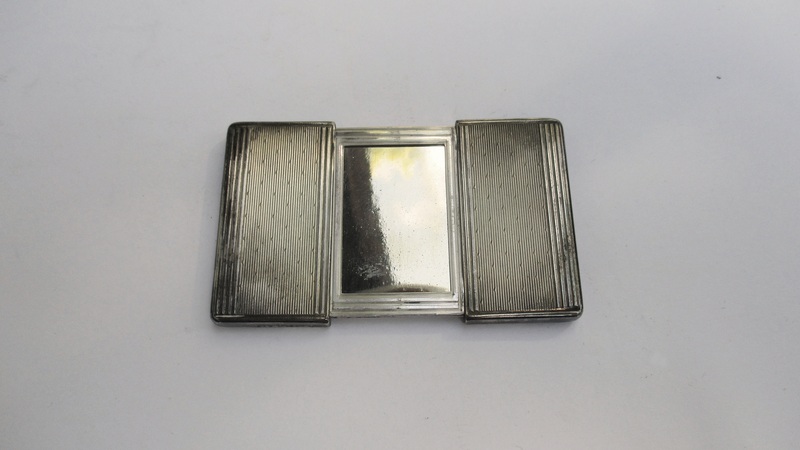 It opens up to reveal a tiny mirror that measures around 3 x 2cm. On the back is a little fold out stand. It’s probably just a very small compact but I would think most people would prefer to have a larger mirror. I can’t find anything quite like this online, so if anyone knows anything about it let me know! 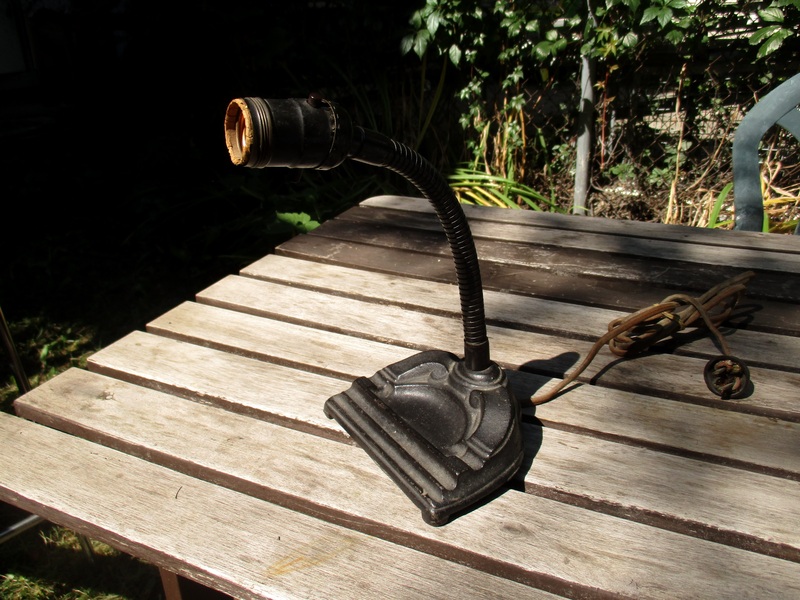 This art deco era lamp might have been my favourite find. It has a great cast iron base and works totally fine. 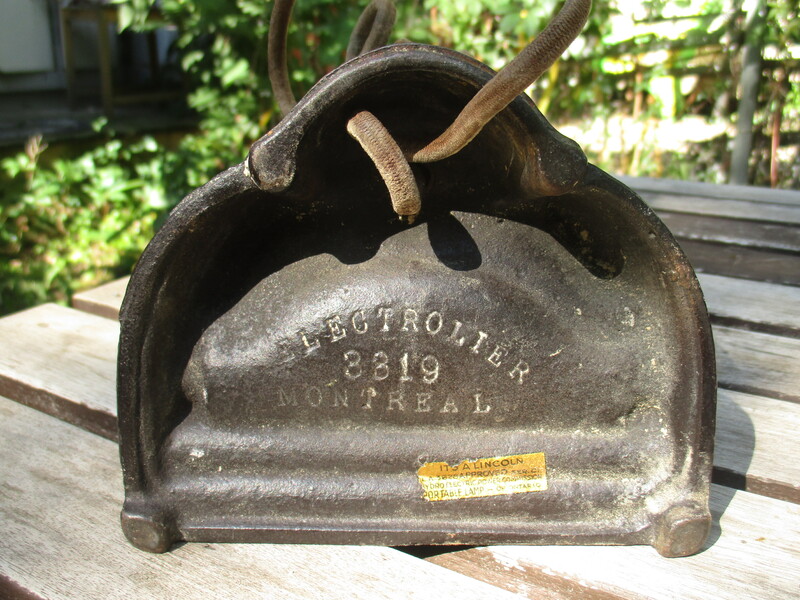 The bottom is marked Electrolier Montreal. I couldn’t find out much about the company, though it seems that it was bought out at some point by Sylvania. I’ll keep my eye on this spot though I doubt it will produce again. The good stuff is typically long gone by the time renovations begin. 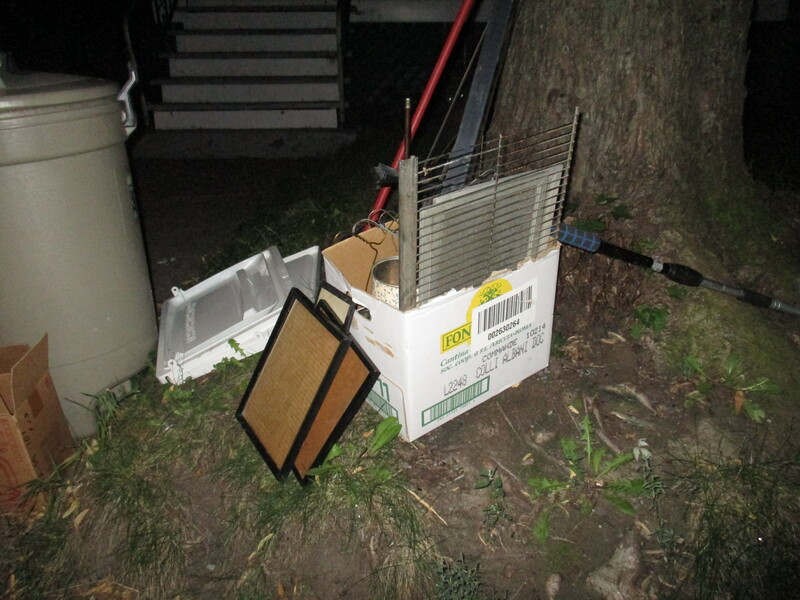 Otherwise, I came across a box of junk in NDG. 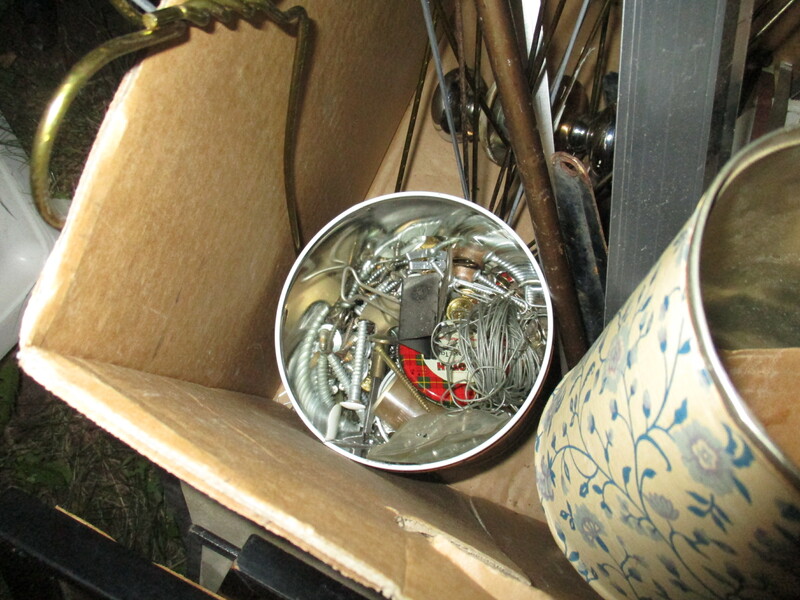 Inside was a tin full of screws and other miscellaneous bits and bobs. However, I spotted some interesting pieces amongst the clutter. They were WWII-era brass Canadian military (likely Navy) buttons. A couple had strange screw backs that I hadn’t seen before. They’re not worth much but make for cool yard sale material. Speaking of yard sales, I did two this weekend and they went very well! I’ll discuss this more on my next sales post, which is due to come out sometime next week. I think the button with the pin is probably a tie pin? 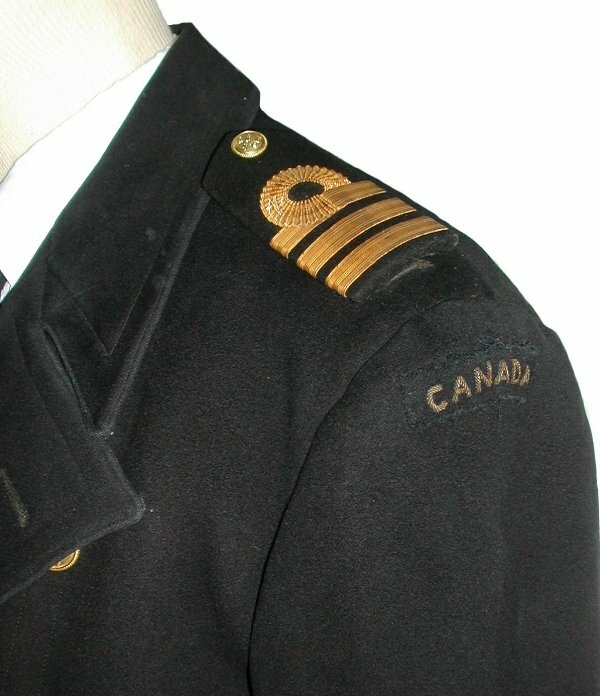 The screw posts on those buttons were likely permanently sewed to the back flap of epaulettes that would be worn on the shoulders of the uniform. The epaulettes’ beck flap would be slipped through slots or loops on the uniform’s shoulders and then have the button screwed on from the visible top of the epaulette to secure it. As epaulettes themselves do not require much laundering they could use the sew-on post. Most military brass buttons need to be removed from the uniform to launder it so the buttons are usually held on with cotter pins rather than sewn on. Maybe I will. I do like to collect things from Montreal. I need to find it one of those shades that screws to the top. Thanks for the link, maybe I will try that. I never get tired of reading this blog. I’ve been hunting for good garbage for the last 4 years, and It’s always nice to read about a fellow man who believes in Reusable Refuseable.